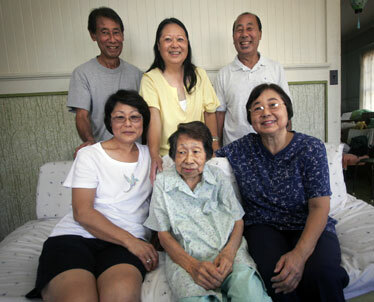 Toyo Asato with her children, clockwise from bottom left, Bette Nakayama, Harry Asato, Jean Iida, Randall Asato and Doris Nakanishi. On the auspicious day of 08-08-08, Toyo Asato will turn 88. Her family will celebrate quietly, as Asato now lives, moving slowly, speaking softly. "I can't remember. Too long time already," she says when asked about her life. But her five children do remember, gathered around her in the family home in Kaimuki, talking about what seems to have been a pretty lively past, in a quiet sort of way. Born in Hawi, on the Big Island's Kohala Coast, Asato moved to Honolulu with her family as a child. The oldest of five children, she went to school only through third grade, then set about caring for the younger ones, working in the family vegetable garden and helping an aunt wash laundry for plantation men. In 1940 she married Yeihiko Asato and they had five children as he worked in his restaurant, the Coffee Pot. But he died in 1953, leaving her a widow in her mid-30s with her youngest just 2 years old. 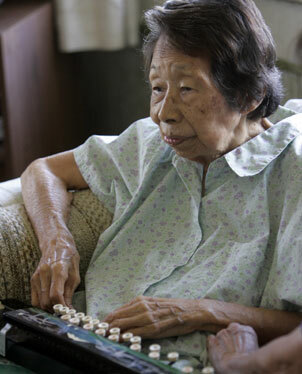 Doris Nakanishi, the oldest of the children, was 13, and remembers her mother working as a hotel housekeeper to make ends meet. She and her brothers and sisters also went to work as soon as they were old enough. The memory of the sacrifices of those years binds them now, and even though both she and sister Bette Nakayama live in California, they return frequently. "It was a long struggle, but we made it," Nakanishi says, "so we're always back here, the family, together." "And she taught me to sew ... And she loved to cook." That basic history now covered, the family reflects on lighter times -- especially their mother's bus outings -- to see Japanese films at the old Toyo and Kokusai theaters; to see Shirley Temple movies; to bon dances and the Cherry Blossom pageant ... She even took Nakayama to see Paul Anka at the Civic Auditorium. "And she taught me to sew -- aloha shirts, capri shorts," Nakayama remembers. "And she loved to cook." "I loved her tripe stew!" youngest daughter Jean Iida interjects. "Oooh, I love that." Although she was a vegetarian, Asato cooked varied dishes for her kids -- tempura with the chives growing in the back yard, for example, and juushii, Okinawan rice porridge to which she added sweet potato leaves and a bit of tuna. Simple food, designed to stretch limited dollars, Nakayama remembers. "To me it was great." As her children started their own families, Asato took care of several grandchildren -- she has 11, and those 11 have given her 23 great-grandchildren. She also cared for aging parents and in-laws. 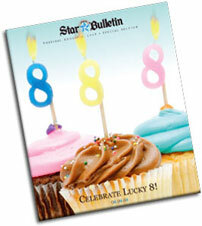 For her birthday Friday, the kids plan a small party at home with their mother's three brothers and two sisters. Nakayama says her mother no longer cares to venture out. "She'll say, 'I don't have to go anywhere. I did a lot in my life, I went to a lot of places.' She says home's the best. She always says that."